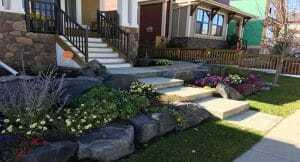 Chinook Landscaping CalgaryWhat Does Landscaping Cost in Calgary? One of the most common questions we get from our customers is what does landscaping cost in Calgary?. The price of landscaping in Calgary can vary greatly from one company to another. We think it’s fair to say that the more established, professional companies in Calgary have consistent costs that will vary 10-15 %. New companies or less reputable companies can have very cheap prices or sky high prices. We think the best way for you to ensure your landscaping costs are competitive is to get 2 or 3 estimates from companies who have been operating in Calgary for at least a few years. Be very cautious about choosing the lowest estimate. You often do get what you pay for and that certainly applies to landscaping. There are many fly by night companies that promise you the world and give you very little in the end. Paying deposits or progress payments is not recommended. The most reputable landscaping companies in Calgary will not ask for payment until they have completed your project. It may be tempting to pay a deposit especially if you think you are getting a great deal on your landscaping. You may feel pressured by your landscaper to pay something up front but we recommend against this. Find a Calgary landscaping company who does not ask for payment up front and you are far more likely to end up with a great looking landscape. The most costly landscaping components are typically anything to do with hardscaping. Hardscaping is patios and walkways retaining walls and garden walls. Hardscaping can also include Outdoor kitchens and courtyard stone. Wood structures can also be one of the most costly landscaping components. These include fences and decks, privacy screens and arbors, pergolas and privacy screens. If you want to reduce costs then you will want to reduce the most costly landscaping components. Or at least reduce the size of the structures. Patios and walkway can look great when the are installed proportionally and that means they don’t have to be huge to make a statement. Make sure to avoid common landscaping mistakes and this will save you money on your landscaping. If you get estimates from companies who are newer and have very little track record you may be getting very low prices or very high prices but more importantly, you may not be getting a company who will show up. Showing up is half the battle. If they do show up, what will the quality of work be like? When looking at potential landscapers, you should consider not only the quality of the initial work but also the companies reputation for service and following up with warranty coverage. You can spend a little for your initial landscaping installation but you could end up spending a lot more in the future if the warranty is not honoured and the quality of the work is substandard. These days, the internet can be very deceiving when choosing a contractor. There are so many review sites, where anyone can leave a review for anyone without being properly vetted. Google and other review sources are a good way to gauge the reputation of a company but many reviews that are not legitimate are posted. It may sound old fashioned but good old fashioned references may be your best approach when choosing a landscaping company in Calgary. Ask your landscaper for names, phone numbers and addresses of previous clients. Call them, drive by the property and have a look at the landscaping that was done.